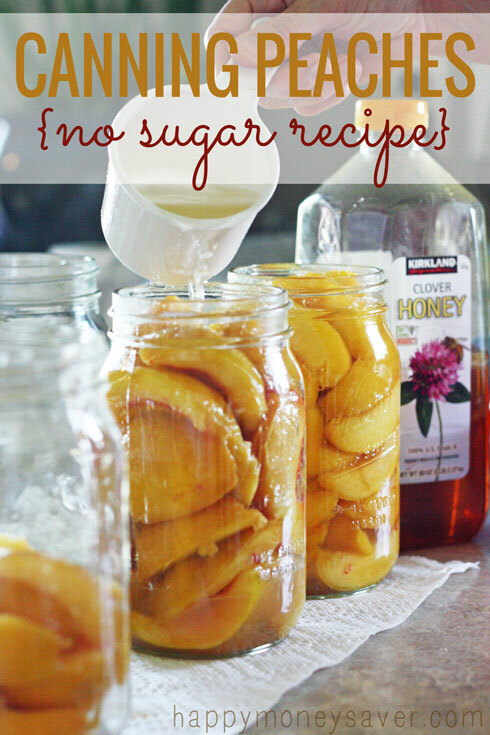 Canning Peaches No Sugar Recipe - Easy and Delicious! I can remember as a child biting into a fresh ripe peach, letting the juice dribble down my chin and thinking life just doesn’t get better than this. As an adult my opinion hasn’t changed. I LOVE fresh, the problem with fresh peaches is that they are only in season for a little while. 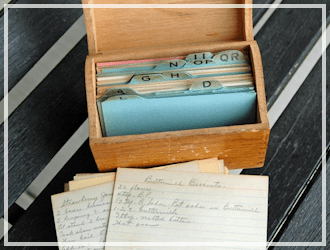 Thank goodness that they can be preserved by canning! 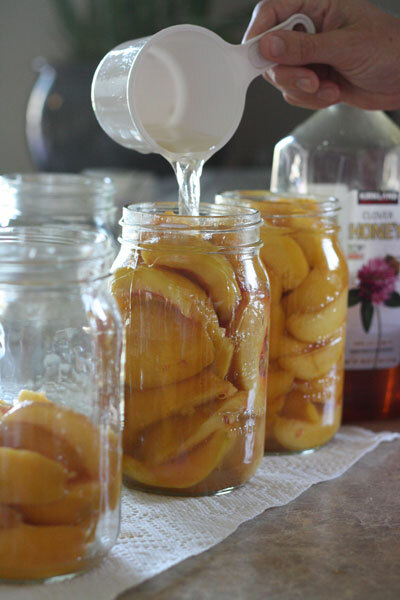 This week my sister and I canned fresh peaches without using sugar and I wanted to share my recipe with you. Growing up my mom was quite the canner. Working all day making peaches, pickles, tomatoes, grape juice, applesauce. She was always hot and tired by the time she was done. I suppose as a child I never appreciated all the work that went into the whole process. As an adult the thought of standing in my kitchen all day carvin’ up peaches just didn’t sound appealing. Let’s just say it took me many years as a mother myself to get the desire to can. But eventually I missed the flavor of homemade peaches, pears and applesauce so I knew I had to try. My sister came to visit me this past week and we decided we would can peaches together. All I can say is that it is SO much better to can with someone. Especially someone who makes you giggle and laugh all the way through the process. We both had to fight the urge to eat them all up too…one for the canning jar, one for me. Two for the canning jar… ahem. 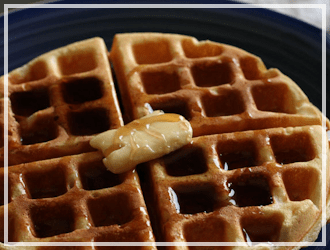 As I am starting on a more real foods lifestyle I wanted my recipe to be without white sugar. I loved the idea of using honey instead, since someday I dream of having my own beehive. 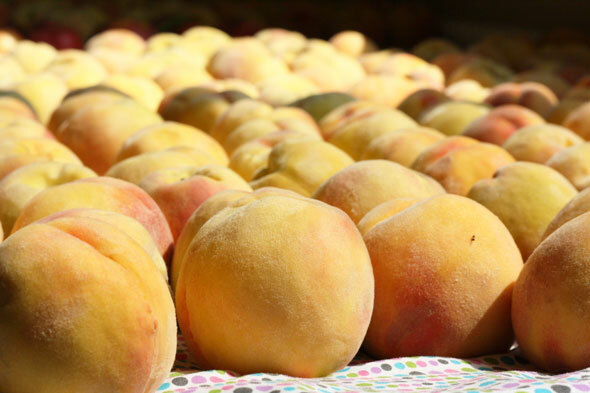 We picked, peeled and canned the peaches together. Then we opened up a jar to try them out. They were wonderful!! 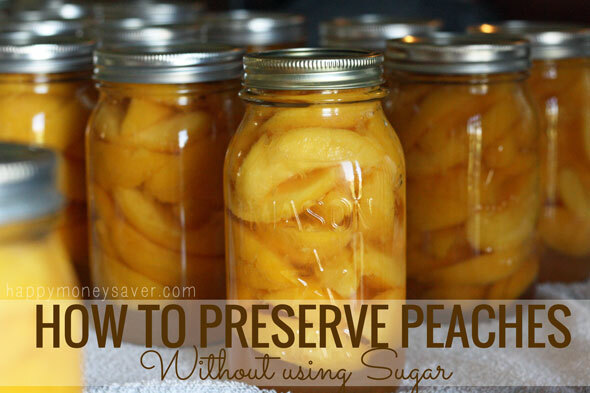 Here is how to preserve peaches without sugar. 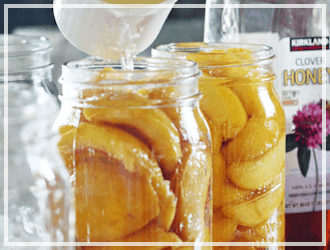 Peaches – use freestone peaches – they make canning easy! The pits come right out. I used Elberta peaches this year. You want to start with some fresh ripe peaches. We went down to our local u-pick orchard and picked 95 lb. of peaches!! We paid $0.70 per lb. I think it will be great when I have my own farm to grow a few peach trees so I will save money. It was so fun picking peaches, we took our kids and had a blast. There were a few peaches we picked that were ripe and ready to eat but the majority of them had to wait a few days. I took a twin sized sheet and laid out each peach individually. If left in the boxes they will bruise more. It took two days and then most of the peaches were ripe. You don’t want them to be too soft or too hard. Gently press them and if they slightly give they are ready. Once you are ready to begin, get your stations ready. 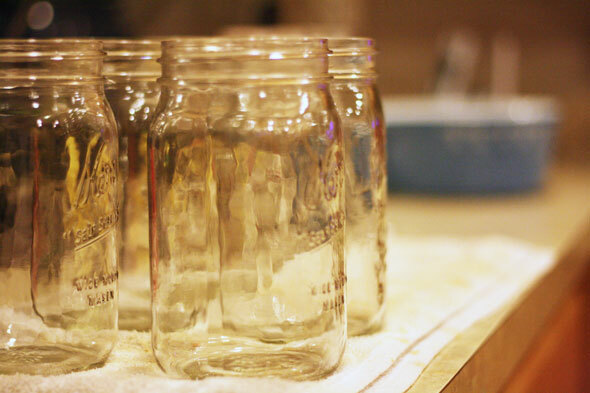 First step is to sterilize your jars and lids. I ran my jars through the sterilize option on my dishwasher. If you don’t have a dishwasher just clean them with hot soapy water as best you can. You want your jars to be really clean to avoid any bacteria that might get in. Also add your lids and rings to a pot and simmer until ready to use. 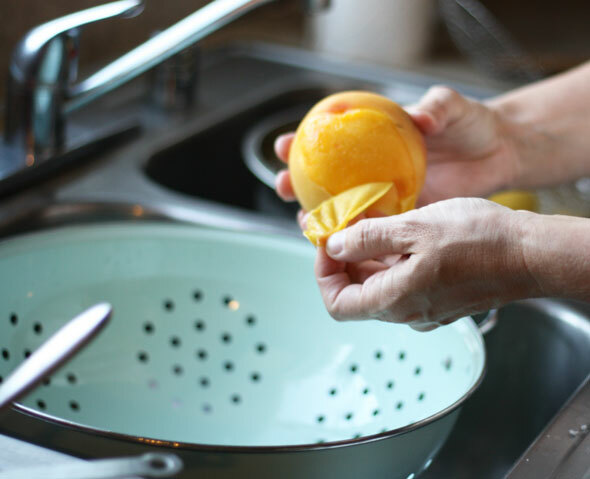 Peel your peaches either using the water bath method or with a peeler. I used the water bath method which is this. Get a pot of boiling water going. 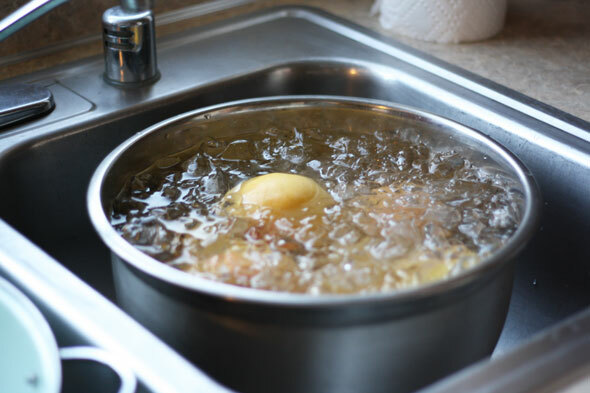 Have a bowl of ice water ready for cooling. Gently add in a few peaches, and then leave for 30 seconds in the boiling water. Quickly remove to the ice water to cool for one minute. Then if the peaches are ripe the skins should just peel off super easily. 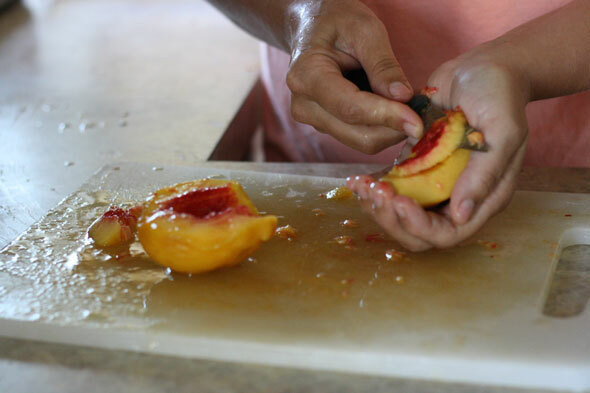 Then take your peaches, slice it in half and remove the pits. I removed the little bit of red next to the pit…and sliced my peaches into 1/4 inch slices. 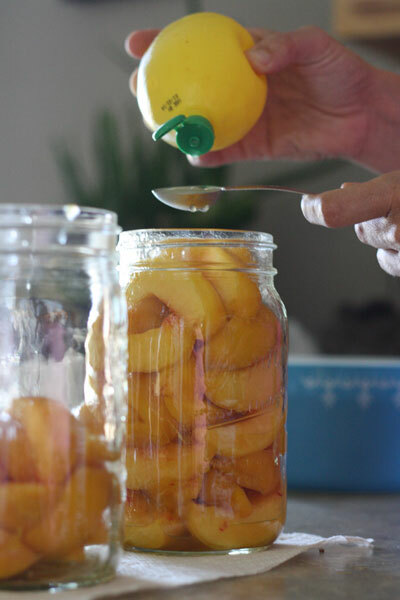 Then add them to the jar.I always stuff as many peaches as I can get in there until I get to the threads of the jar top. To the jars: Add first one teaspoon of lemon juice to preserve color. 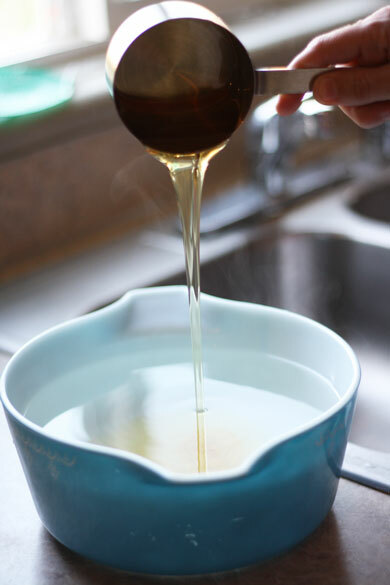 Then in a separate bowl you take 7 cups of warm water and mix in 1/3 cup of honey. I love this picture. It’s artsy-fartsy. Pour the honey water combo into your jars leaving about 1/2 inch of headroom. I would also jiggle the jar to release any pockets of air. Next add the lids and rings to the top of the jars. 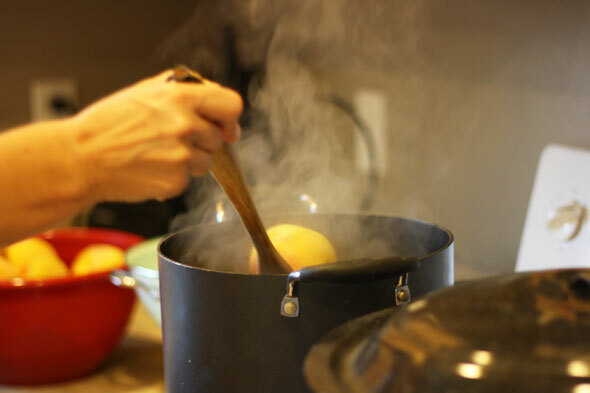 You can use a fork to get the lids out of the simmering water or one of those cool canning magnets. Don’t screw on the rings too tight. Place the jars into your canner and make sure there is 1 inch of water above the tops of the jars. Once the water is boiling boil your jars for 15-20 minutes. The canning manuals will tell you to cook them for 20-25 minutes but I choose to do it for 15 minutes. If for some reason once they are all cool you have a jar that didn’t pop, that means it didn’t seal right. 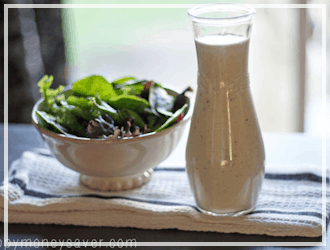 So you can go ahead and eat right away or save in your refrigerator for up to a week or two. 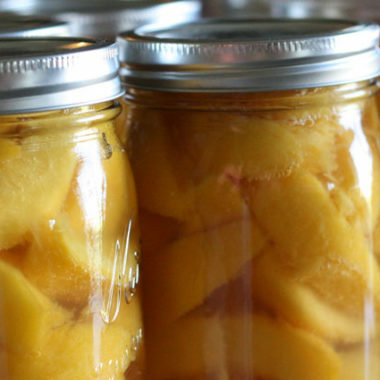 No sugar needed to make these delicious canned peaches. 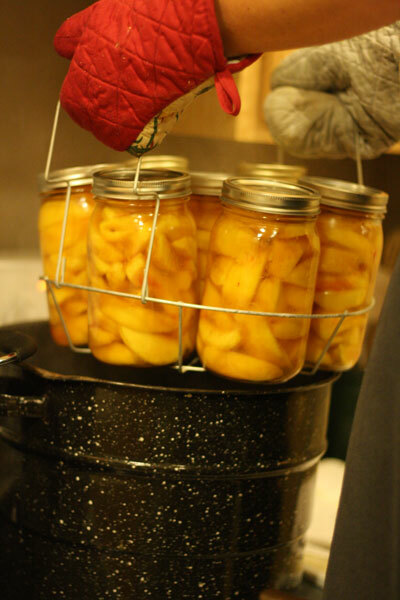 Peaches - use freestone peaches - they make canning easy! The pits come right out. I used Elberta peaches this year. I ran my jars through the sterilize option on my dishwasher. If you don't have a dishwasher just clean them with hot soapy water as best you can. You want your jars to be really clean to avoid any bacteria that might get in. I removed the little bit of red next to the pit...and sliced my peaches into 1/4 inch slices. Then in a separate bowl you take 7 cups of warm water and mix in 1/3 cup of honey. I love this picture. It's artsy-fartsy. Next add the lids and rings to the top of the jars. 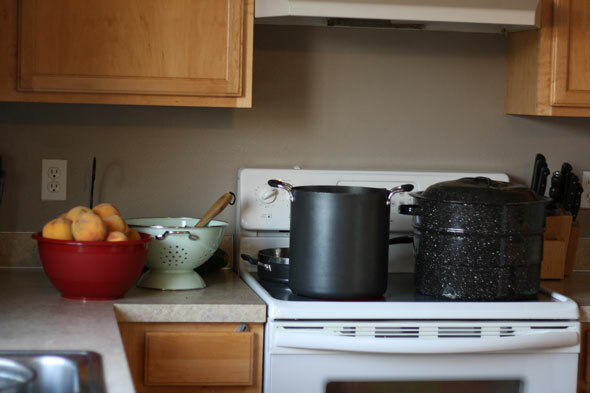 You can use a fork to get the lids out of the simmering water or one of those cool canning magnets. Don't screw on the rings too tight. 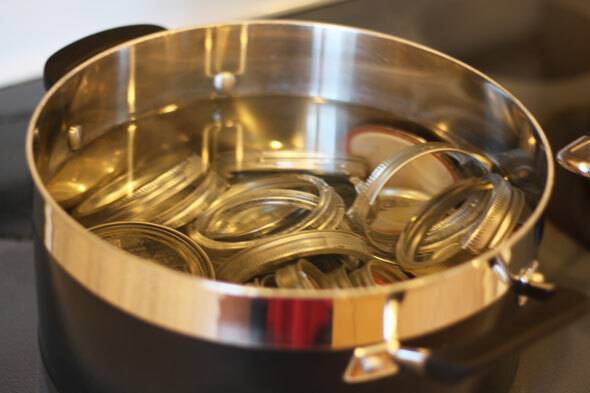 Place the jars into your canner and make sure there is 1 inch of water above the tops of the jars. Once the water is boiling boil your jars for 15-20 minutes. The canning manuals will tell you to cook them for 20-25 minutes but I choose to do it for 15 minutes. If for some reason once they are all cool you have a jar that didn't pop, that means it didn't seal right. 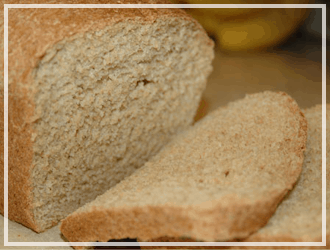 So you can go ahead and eat right away or save in your refrigerator for up to a week or two. 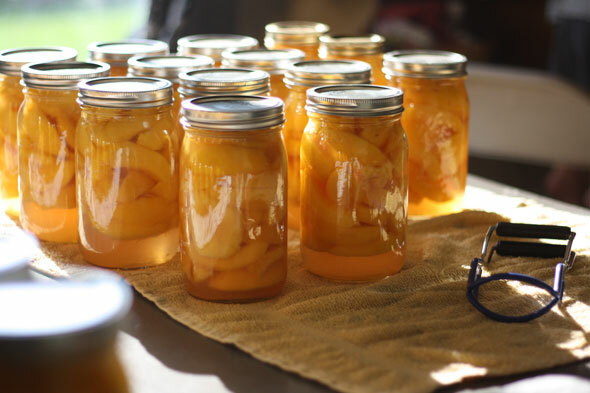 After you are all done canning your peaches, consider doing a happy thought by sharing a finished jar with a friend saying “I love you to Peaches”. Who wouldn’t love that? 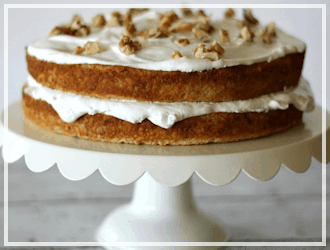 How many pounds of peaches are needed for this recipe? My mother canned peaches and other fruits. And did not use a canner . She made the syrup b roughy it to a boil ex:added the skinned peache halves stone removed and simmered 3 minutes packed in hot sterilized jars and sealed. Would like your comment. 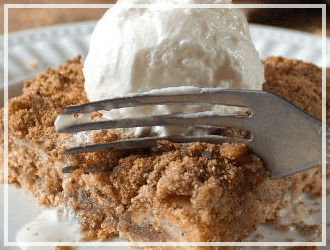 I actually used this recipe last year and I have to say these peaches canned are the best I’ve ever had. I’m new to canning. Do you have to add a sugar-based liquid to preserve fruit? I would rather not add any sugar (that includes honey) if possible. 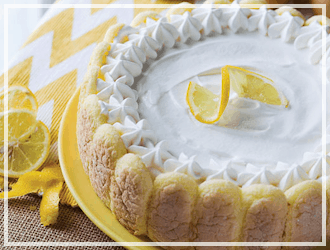 Can you just do water and the lemon juice or would it not taste right? Is it safe to re-use mason jar lids? Is it necessary to peel the peaches first? .. I’d just as soon leave the peelings on as this is how I eat them normally. NOTE: Wipe top of jar, with a clean wet cloth to remove any spills, before putting on lid. Otherwise the jar may not seal. any way to tell for sure if the jars sealed properly other than listening for a “pop”? I did not remain in kitchen after putting jars on towel to cool, so couldn’t have heard any pops. Even if I had been in there, how was I to know which jar popped .. would there have been any visible sign .. all of my jars seem to be o.k. … tops are flat .. fruit still LOOKS good inside after one week.